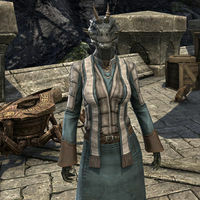 Neetra is an Argonian member of the Mages Guild who can be found directly north of their tower in Skywatch. When first met, she is concerned about her defective Dwarven spider pet Has-Many-Legs, as she had been denied the required spare parts to fix it. When you approach Neetra near the Guildhall, she asks for your help, "Hey there, do you have a moment?" "My little construct is sick. I want to repair him, but Telenger expressly forbade me. Says the parts are too valuable, that they shouldn't be wasted on a pet. But Has-Many-Legs is such a sweetie." "Thank you. I happen to know some of the nobles in town collect Dwemer parts as baubles. If you could find me a ring, a gear, and a tube, I'd have Leggy jumping around good as new in no time." "The Archmage, Telenger the Artificer. He owns the Emporium here in town, and leads the Mages Guild of Skywatch. He's a crusty old crank when it comes to getting his way." How did you get a dwemer construct as a pet? "I found Leggy on a Guild expedition to Morrowind. He was huddled in a corner, shaking, and I coaxed him out. Tweaked a few of his gears back into shape, and... well, we've been together ever since!" Aren't you asking me to steal? "No, no! Don't look at it that way. Look at it from your view down the river. If you look back and see Leggy and I standing here, forlorn and forgotten, won't you regret that? More than you'd regret taking a few baubles those nobles won't miss?" Return with the required parts. "Did you find everything?" "I'm sorry to hear that. But at least you found the parts. I'll fix Leggy up good as the day he was forged. From where my heartwater wells up, I thank you." This completes the quest. After successfully repairing Has-Many Legs, Neetra is overjoyed: "Thank you again. Look at Leggy go!" This page was last modified on 16 October 2017, at 21:35.